Is Mother Jones Holding Undercover Petaluma Egg Video To Higher Standard of Proof? The commentary surrounding Direct Action Everywhere's (DxE) undercover video footage of Petaluma Farms continues. The latest article of note came from Mother Jones's Tom Philpott. Philpott's piece is a strong one. 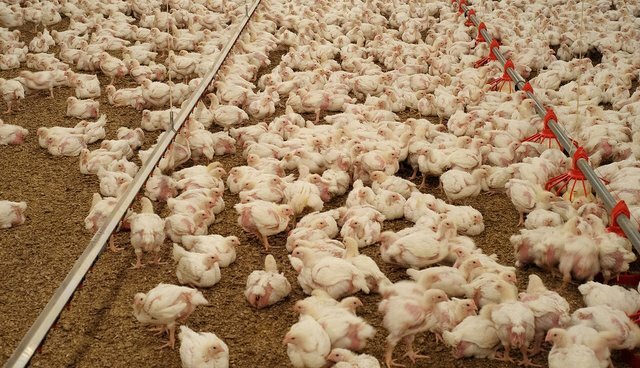 It does a good job highlighting the bogus nature of "cage-free," a designation that consumers are increasingly coming to realize is pointless. It also takes the luster off the "organic" label, one that consumers too often mistakenly associate with high welfare standards. These are important themes to drive home and the article does it well. But Philpott's handling of DxE itself warrants scrutiny. As a vocal defender of pasture-based animal agriculture, Philpott evidently has no problem with slaughtering and eating domesticated animals per se. This position seems to make him suspect of DxE's aggressively vegan ideology. "The group," he writes early in the piece, "seems to find all animal farming abhorrent." Well, yes. This is true. But it's hard to see why DxE's agricultural and dietary philosophy matters in the context of Petaluma Farms. One thus wonders if Philpott, who has produced pastured pork himself, included it for purely strategic purposes. The anti-animal agriculture description drops a hint that suggests these DxE fence-jumpers are, you know, a little nuts. His reference to them as "radical animal-rights activists," a term he knows carries pejorative connotations, drives home the suggestion with little subtlety. But what DxE's members eat has absolutely nothing to do with the footage obtained on Petaluma Farms. Nonetheless, DxE's stance against all animal agriculture, even the kind Philoptt once practiced, seems to have shaped his coverage.